If I had only had one child, this would be the most boring discussion about the best baby lotion possible. My first child had no allergies or skin issues. We exclusively used Johnson’s Baby Lotion, and I loved it. The second child was completely different. Because of his skin sensitivities, we tried many baby lotions until we found what worked best for him. Here’s what I discovered on our quest for the best baby lotion. That’s right! You heard it here first; the best baby lotion isn’t even for babies! I’m so thankful that I was already using Aveeno Daily Moisturizing Lotion because, otherwise, I might not have even thought about trying it. I am a fan of fragrance. Unfortunately, my son’s skin was not. Initially, I had no idea what was causing bumps on my baby’s skin. He was otherwise very healthy, so I decided to make changes to his soap and lotion. It turns out that many baby soaps and lotions contain fragrance, and some babies can be sensitive to that. Your child might have small bumps or an irritated area that seems to persist after several days. Although nothing is absolute with skin conditions on children, this might be a reaction to fragrance. That’s why it’s so important to use fragrance-free lotions and soaps when you’re caring for your little one. It’s fragrance free: Although fragrance free lotion isn’t essential for everyone, switching to fragrance free lotion is a great change to make if your child is having skin issues. It does a great job moisturizing dry skin: Whether you’re using this lotion in winter or summer, it always does a great job providing just the right amount of moisture. It’s not very expensive: Aveeno has a repitation of being a high-quality product for a budget price. I like that my child and I can use the same lotion: By only having one bottle of lotion to share, we save on counter top clutter. It’s not greasy: Unlike some other lotions, after your moisturize your baby, you don’t feel like you need to wash your hands. 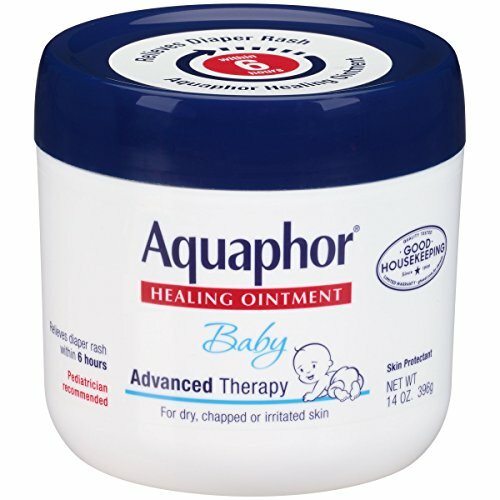 For stubborn issues with dryness or diaper rash, you can’t beat Aquaphor. This thick petroleum-like product covers the skin, moisturizes it, and protects it from irritants. You can’t ask for more than that! However, it’s not necessary all the time. Aquaphor effectively treats even the angriest of skin conditions. We have used it on diaper rash and a form of baby eczema. If you’ve got a case of very dry skin, it will moisturize it quickly. Although the super moisturizing powers are wonderful, I particularly love Aquaphor’s ability to treat, seal, and protect. When you’ve got a baby with diaper rash, the last thing you want is a product that either doesn’t offer enough protection from or sticks to waste matter. It’s tough to find a diaper cream that offers protection yet is also able to be easily removed with a wipe. Aquaphor is the perfect solution. It’s a wonderful moisturizer: Aquaphor heals dry skin in a snap! It has so many great uses for skin. It treats, seals, and protects your baby’s skin: If you’re trying to protect your little one from (or get rid of) diaper rash, this lotion is the best. It comes off easily with a wipe: If you’re used to using Desitin on diaper rash, you’re really going to love how smoothly Aquaphor cleans up. I have to wash my hands after I apply it: You should absolutely always wash your hands after applying anything to your child’s diaper area. However, even if you’re just trying to heal rough elbows, you may want to wash your hands after application because this lotion is so thick. Unless you’re treating diaper rash, this is probably only appropriate for winter dry skin issues: That makes this a very seasonal product, and it can be annoying to have a product that can only be helpful during one season of the year. 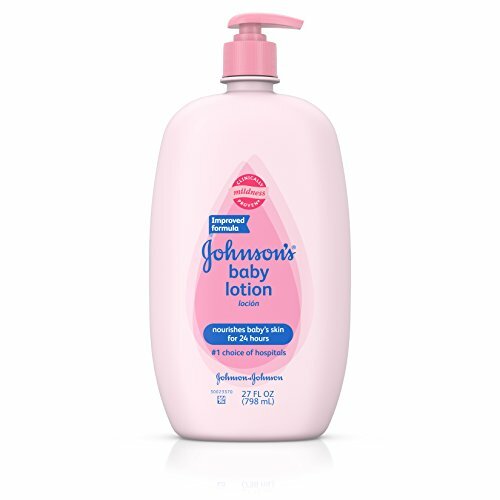 If I would have only had one child, I would have sworn up and down that Johnson’s Baby Lotion was the only lotion you would need. My older son had no skin issues while using this lotion, and it made him smell absolutely wonderful. I love how fresh this baby lotion made my older son smell. Because I believe in playing hard and getting dirty, he had a bath every day. It was a delight at the end of the day to wash and lotion him, then snuggle while we read. When that boy was washed and lotioned, it produced a smell better than anything else I’ve ever smelled. Literally, the smell has made me drool. I love that smell: Oh, that sweet smell of babies! I don’t know what their specific fragrance is, but it is always my idea of the perfect smell for a baby. It does a good job moisturizing skin: With my oldest, the lotion was a great moisturizer that didn’t cause any skin issues. The lotion is smooth and non-greasy: I’ll confess that I never minded squirting out extra lotion because I just used it on myself. I never felt like I needed to wash my hands or wipe them on something after using this lotion. Fragrance can cause skin issues for some: Unfortunately, the fragrance that I love so much can cause skin issues for sensitive babies. It has red 33: There are several reasons why you should avoid dyes in your foods and beauty products. Among them are that people can have allergic reactions to them, and they can cause hyperactivity in sensitive children. Check out this article by Healthline to learn more. The lotion that I was most disappointed in was the Aveeno Baby Calming Lotion. Maybe I thought the lotion actually had lavender (because of the label) or maybe I thought the lotion would actually help calm my fussy baby. In both cases, I was wrong. I don’t think this lotion contains anything above a lavender smell, and smell alone will not help sooth a fussy baby. I’m a big believer in form and structure, so I wanted to take a moment to tell you about what I like best about the Aveeno Baby Calming Lotion. Unfortunately, I don’t really have anything of substance to say. It smells nice, but it doesn’t feel good on your skin. In my opinion, it might serve as a lotion and moisturize your skin, but it doesn’t deliver on its promise of calming babies. It smells really good: I’m partial to the smell of lavender. This lotion smelled fresh. I love using lavender and other oils to calm and soothe my baby: I’m a big believer in using oils like lavender to help calm and soothe. Unfortunately, given the list of ingredients, I’m not sure that there’s actually lavender oil in the lotion. Instead, it might contain a lavender smell. Fragrance can cause skin issues for some: As we’ve discussed, fragrance can irritate sensitive skin. It didn’t feel good on my skin: I was really surprised that I didn’t enjoy how this lotion felt versus the Aveeno Daily Moisturizing Lotion. Honestly, I expected this lotion to be the Aveeno Daily recipe with some lavender added. It didn’t particularly soothe my baby: When you’ve got a fussy baby, sometimes you’re looking for a miracle cure. Unfortunately for us, this lotion didn’t work out for us that way. There’s some controversy around the use of lavender on boys right now: Some studies are showing that lavender can cause breast growth on boys. I’ll discuss this in the section below. 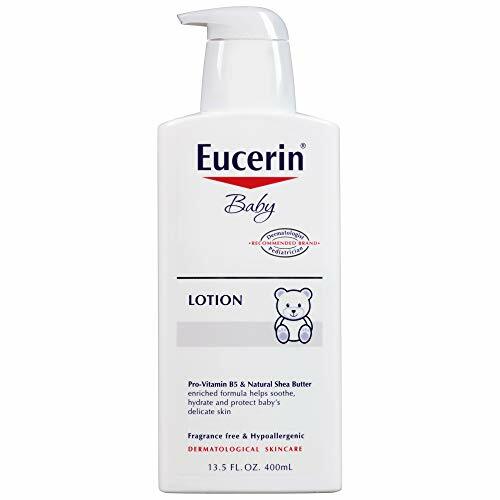 Although I didn’t personally try Eucerin Baby Body Lotion on my babies, this was the next lotion on my list. I have a lot of friends that swear by this baby moisturizer. This is a go-to lotion for families where skin sensitivities and eczema are present. It’s not medicated, but the ingredients, mostly shea butter and pro-vitamin B5 are intensely moisturizing and calming, especially to baby skin. If you or your kids have ever had a skin rash or problem, then you know how harsh and irritating most skin products can be. Even some of the medicated lotions and ointments contain too many ingredients that do more harm than good. That’s why I love the hypoallergenic and non-scented formula that this lotion for baby uses. Plus, it has good old glycerin, which is a skin saving superstar. Perfect for Eczema: This is one fo the few lotions that won’t make your baby’s eczema flare up. It’ll help keep the itchiness away. Good ingredients: the Shea butter smoothes your baby’s skin and the glycerin helps to seal in moisture so that the dryness doesn’t get worse. The Vitamin B5 is nourishing for growing skin. No bad stuff: There’s no frangrances, parabens, dyes, or drying alcohols (although it does contain cetyl alcohol, which is a type of emulsifier). It’s hard to find a baby lotion without alcohol. It feels good: This is a light lotion! It’s not greasy like a lot of other baby lotions. It absorbs quickly and stays in the skin without rubbing off on clothes or surfaces. Almost too light: This isn’t a thick and creamy baby moisturizer. It’s a bit on the thin side, but that’s what keeps it feeling light on the skin. Non-medicated: This doctor-recommended lotion touts how good it is for eczema, but it has no actual skin medications in it. I would like it if it had just a touch of hydrocortizone or something to not only make the rashes not flare, but to help get rid of them! When you’re deciding which baby lotion is the best for you and your baby, there are three main things that you want to do. First, know specifically why you want the lotion. Is it to soothe your child or treat diaper rash or moisturize a rough spot? Any of those specific reasons will warrant a specific kind of lotion, just as a goal for a regular daily moisturizer warrants a different kind of lotion. Next, read the ingredients. Know exactly what you’re buying before you smooth it all over your child. Finally, you need to be aware that lotions with additional oils might cause future health problems for your child, particularly if you have a boy. Before you buy a lotion, you need to know exactly why you’re buying it. If you’re looking for a daily moisturizer, make sure to shop from those types of lotion. Think of it this way, sunblock and diaper cream are both important for your baby, but you wouldn’t use them interchangeably. It’s the same thing with lotion. Be clear about your specific reason for use before you buy a lotion for your baby. Remember, if your baby has a sensitive head or scalp, try some cradle cap shampoo to gently wash their hair. Your body’s largest organ is your skin. So, before you go slathering lotion on it, know exactly what’s in that creamy concoction. If you’re shopping for someone with sensitive skin, avoid products with fragrance and dyes. You might also think about avoiding alcohols; this can be an easier-said-than-done situation because many beauty products contain alcohols. Regardless, take the time to read the label and make sure that you’re okay with applying those contents to your skin. The use of lavender, particularly on young boys, is a little bit of a controversial subject right now. Some studies are showing that lavender use can cause boys to develop breasts. This claim isn’t a new one, but recently this claim has resurfaced. This article by Forbes explains what scientists are discovering. 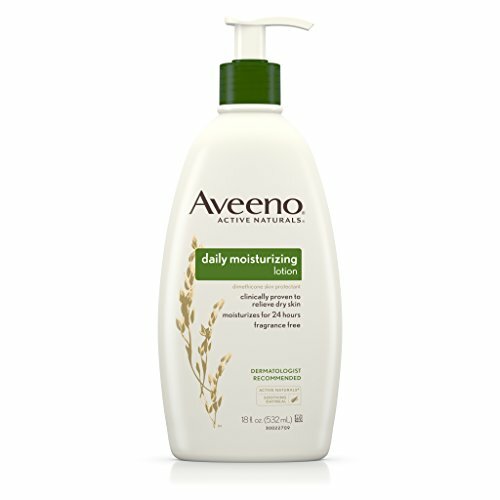 I would absolutely recommend that you try to the Aveeno Daily Moisturizing Lotion. With its moisturizing abilities, smooth texture, and quality ingredients; this lotion is my absolute favorite. Plus, you and your child can share it so you don’t have the extra clutter of having multiple moisturizing products. After graduating from TCU with a degree in English, I took a break from writing. After accumulating some life experiences and children, I returned because I finally had something to say. I'm passionate about helping people be their best. Whether it's giving advice for success in parenting or information about how to improve your personal health, my top priority is to give you the best information possible.